Despite the fact that there always seems to be saber-rattling between the United States and Russia, our space programs get along famously. During this nine-day space mission, the American Apollo command/service module, or CSM, linked with a Soviet Soyuz spacecraft. 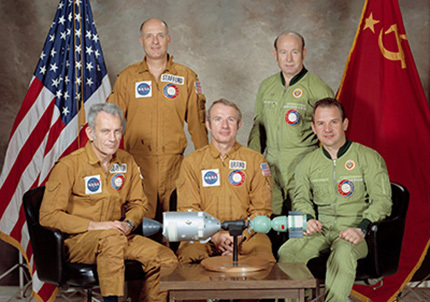 The docking collar, which enabled the two spacecraft to connect, was developed cooperatively between NASA and the Soviet Academy of Sciences. 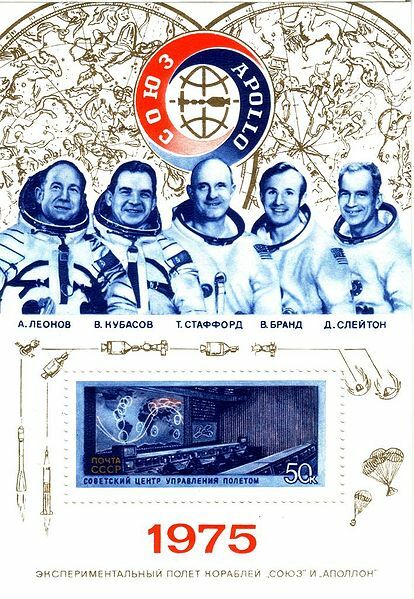 On July 15, 1975, the Soviet Soyuz-U and Delta IB launch vehicles (that’s rockets to you and me) lifted off within seven and one-half hours of each other and docked two days later. After three hours of docking, the hatches opened. 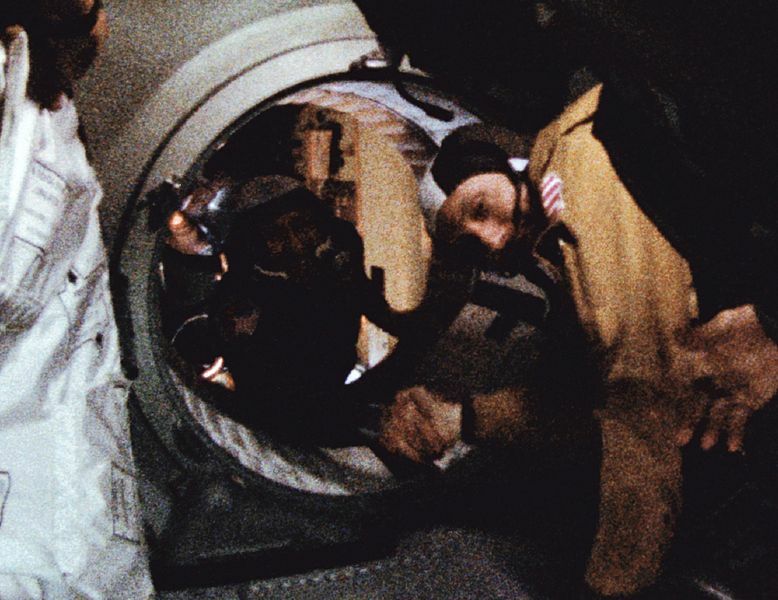 Mission Commanders Stafford and Leonov reached towards one another and engaged in the first international handshake in space. The joint crew spent 44 hours together conducting scientific experiments, exchanging gifts and flags, visited each other’s ships, ate together and shared a few laughs. Stafford tended to speak Russian with a drawl, prompting Leonov to joke that he spoke “Oklahomski.” President Gerald Ford made a phone call to congratulate the men on their mission, and a statement was read by Soviet President Leonid Brezhnev. After the mission had ended and both crews returned to Earth, citizens of both nations delighted in shared accomplishment. President Ford personally greeted the cosmonauts. The Americans took their Soviet colleagues and friends on a tour of the United States, and the Soviets returned the gesture with a tour of their own. In 1977, Soviet astronomer Nikolai S. Chernykh discovered a minor planet in the asteroid belt and named it 2228 Soyuz-Apollo, to commemorate this unique mission. On February 19, 2014, Valery Kubasov died at the age of 79. No cause was given, but certainly members of the space community of all nations felt the loss of this pioneer of cooperative international missions. He served as the flight engineer and technical expert. Today, this legacy continues on through the International Space Station and other missions, both off-world and on, through the dedicated scientists, space engineers and others, who recognize that the shared accomplishments and discoveries through cooperation far outweigh those of less peaceful purposes. Perhaps one day scientists will become presidents, and the world will be ruled by logic instead of vice.